In March we raise awareness for multiple myeloma, also known as Kahler’s disease. Multiple myeloma is a form of cancer that was first described by the Austrian physician Otto Kahler. The disease occurs when errors in the DNA cause plasma cells, a specific type of white blood cells, to start growing in an uncontrolled way. These malignant plasma cells (also called myeloma cells) end up in the bone marrow, where all different types of blood cells are produced. Because there are often several (multiple) outbreaks in the bone marrow, the disease is known as multiple myeloma. The proliferation of the plasma cells hampers the production process of blood cells, resulting in a shortage of healthy blood cells. This can lead to anaemia (causing fatigue), bone degeneration, kidney damage, and recurring infections . Because the symptoms are quite general, patients are often diagnosed in a late stage. In Belgium, there are annually more than 826 people diagnosed with multiple myeloma . Although the condition is not well known by the general public, it still has a big impact on patients and their environment. At Janssen, we therefore want to make Kahler’s disease a treatable and even curable condition. Luckily, our commitment has not been without result. We will also continue our work in order to make victories, big or small, possible. 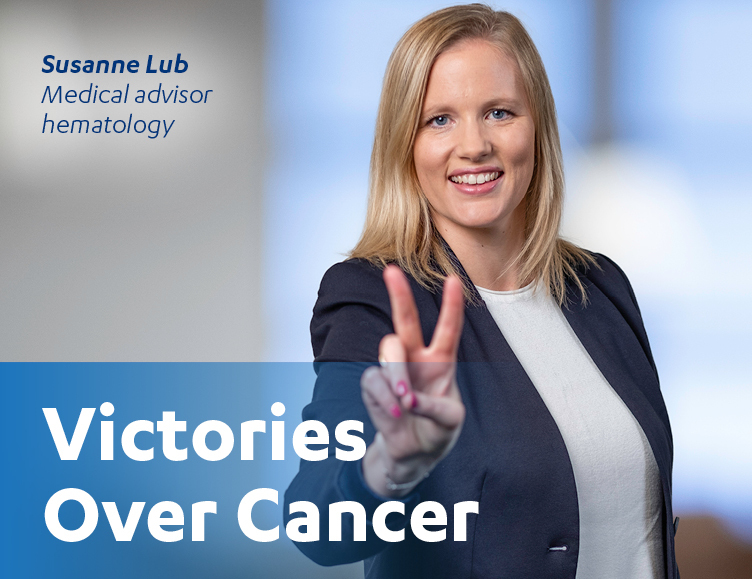 Our colleagues Tine Casneuf and William Deraedt therefore explain their daily strive for victories over cancer. Bioinformatician Tine Casneuf is Scientific Director in Janssen’s Myeloma Disease Strategy team. She studies the mode of action of our medicines in patients and preclinical models. “Our team translates the science from preclinical studies, for instance from cellular systems, to possible new treatments,” says Tine. “We also do the opposite: translating molecular data to possible new leads for medicines of the future”. Ever since she was young, Tine was interested in science. That is why she likes to work at Janssen: “It is a place where I can have societal impact and work together with people with different cultural backgrounds”. In recent years, the progress in molecular technology has been the driving force behind the victories over multiple myeloma. This fuels our ambition to be able to cure, and eventually also prevent cancer in the future. We call that interception. “We want to understand the onset of diseases like multiple myeloma. We want to use this knowledge to prevent patients from developing cancer”, says Tine. Scientific discoveries and their practical applications need to reach the patients as well. That is why William Deraedt, Senior Director Clinical Scientist Leader, and his team want to show that our innovation actually deserves its place in the treatment of a patient. They do this in phase 2 and phase 3 of the clinical research, the so-called late development phase. “During the last 14 years, I have worked on medicine against Kahler’s disease. I am proud of what we have contributed to the fight against this disease”, says William. In March, we pay attention to Kahler’s disease and our victories on social media. But we want to hear your stories as well! Will you join the conversation? Share your story and use #VictoriesOverCancer.